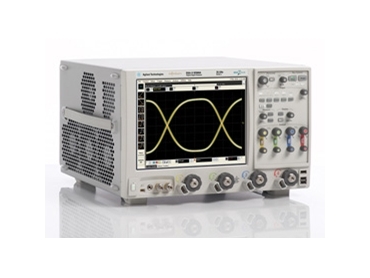 Agilent Technologies has introduced the Infiniium 90000 X-Series oscilloscope family with real-time bandwidth of 32 GHz. Ten new models range from 16 GHz to 32 GHz and are bandwidth upgradable. These new scopes deliver low noise (2 mV at 50 mV/div, 32 GHz), low jitter measurement floor (~150 femtoseconds) and deep memory (2 Gpts) ensuring measurement accuracy. In addition, the 90000 X-Series oscilloscopes offer more than 40 measurement-specific application packages including jitter, triggering, measurement and analysis tools as well as full compliance certification test suites. Engineers working with high-energy physics, emerging wireline communication standards and high-speed serial data links such as USB, SAS or PCI Express® use oscilloscopes to capture fast, single-shot events and to make critical measurements such as jitter while ensuring compliance to industry standards for interoperability. With data rates in the next few years extending beyond 10 Gbps, engineers need oscilloscopes that can deliver higher bandwidth measurements. Agilent invested in a proprietary indium phosphide (InP) integrated circuit process to enable high-frequency capability while yielding low noise floor and jitter measurement floor. Custom aluminum nitride packaging technology combines five InP chips in the front-end multichip module, which incorporates unique noise shielding and heat dissipation techniques. This breakthrough technology gives the new Infiniium 90000-X Series scopes true analogue hardware performance to 32 GHz. The new Infiniium 90000 X-Series oscilloscopes measure random jitter at approximately 50 percent of the level reported by competitive products. This increased measurement accuracy returns critical design margin to engineers.